One of the major differences between the world of Lewis and Clark and our world is transportation. Today, most people travel either by car or by plane, and in a few big cities by rail. Almost no one has really experienced river travel, the main means by which people got around in Lewis & Clark’s day. In the late 18th and early 19th century, a variety of boats plied the nation’s inland waterways, powered by sail, oar, paddle, and tow rope. Many of these traveled on the great Ohio River, the main artery from the East into the American interior. Starting at the confluence of the Allegheny and the Monongahela rivers near Pittsburgh, Pennsylvania, the Ohio River meanders along a southwest and then west-northwest course until it reaches Cincinnati, then bends west-southwest until it joins the Mississippi River near present-day Cairo, Illinois. The Ohio River dominated the landscape for anybody traveling west, and it figures prominently in our novel, The Fairest Portion of the Globe. Lewis and Clark were no strangers to rivers. 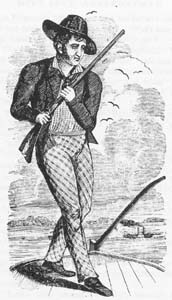 William Clark was known as an expert waterman, having grown up in the Ohio River town of Louisville, Kentucky. By the time he assumed co-command of the Lewis and Clark Expedition, Clark had piloted a variety of watercraft on the Ohio, Mississippi, and inland waterways of the East. Meriwether Lewis was intimately familiar with river travel as well, having served as an army officer in Cincinnati and at Fort Pickering along the Mississippi. Lewis’s post as an army paymaster before he became secretary to President Jefferson necessitated frequent travel to remote army posts all over the West, many of which could only be reached by water. In Lewis and Clark’s day, keelboats were the most commonly used boats for passenger transportation and freight along the great rivers, though passengers also tagged along on flatboats and barges, the crafts used to move heavier freight. 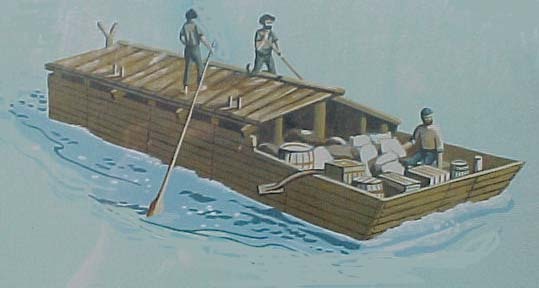 Unlike flatboats, which were typically broken up for lumber when they floated to their destinations, keelboats were capable of going up river as well as down. Downstream, a keelboat typically made about 15 miles an hour; upstream, about 1 mile an hour. payd the man his charge which was one dollar; the inhabitants who live near these riffles live much by the distresed situation of traveller are generally lazy charge extravegantly when they are called on for assistance and have no filantrophy or contience [conscience]. A keelboat could be anywhere from 40-80 feet long and 7-10 feet wide. 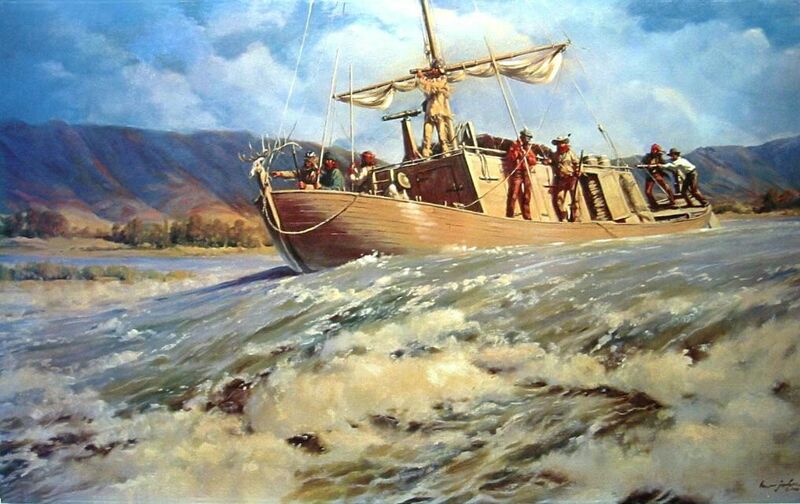 Lewis and Clark’s keelboat was a typical size, about 55 feet long and 8 feet wide, with a 3- to 4-foot draft. 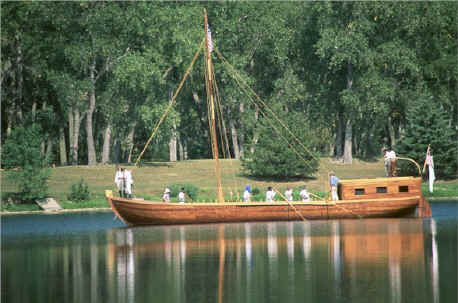 For propulsion it had a 32-foot sailing mast, 22 oars, a rudder, and a tiller for steering. A heavy timber (the keel) ran down the center of the entire length of the bottom of the boat to absorb the shock of running into underwater obstructions and to make for easier steering. The boat included a cabin and lockers for storage that also served as walkways for poling. When Governor Meriwether Lewis left St. Louis for the last time on September 4, 1809, he probably left on a keelboat. Although the deck of a keelboat was partially roofed over so that the passengers could get out of the sun or rain, Lewis would have enjoyed no other comforts or amenities, and no privacy. During Lewis’s last journey, whatever illness or anguish he endured during the ten days between his departure from St. Louis and his arrival at Chickasaw Bluffs (Memphis) 11 days later, he would have suffered in full view of Mike Fink, God, and anybody else who chose to stop and stare. Given Lewis’s reported ill health and disordered state of mind, it’s small wonder that rumors of Lewis’s problems were the talk of the entire Mississippi River Valley within days of his departure.